High hardware maintenance costs, power consumption and footprints of legacy Alpha hardware. Any application design restrictions preventing an upgrade to Integrity, or other platforms will no longer apply. AlphaVM emulation requires no extensive re-engineering or testing. AlphaVM emulation requires no changes to the operating system or application software. HP no longer manufacture Alphas, so spares are becoming increasingly scarce. HP no longer supports most Alpha kit. Where support is available it’s expensive. Improved performance, whether I/O or CPU bound, is guaranteed. AlphaVM supports multiple Alphas on a single Intel processor. AlphaVM supports the most complex cluster configurations. Your users will not know you’ve switched off the Alpha. Except for the performance boost! Your Finance Director will know you’ve switched off the Alpha. Support and maintenance costs will plummet. The professional version, replaces Alpha servers working in data centres or industrial settings. The AlphaVM-Pro Alpha emulator has high performance and reliability characteristics. It's performance is on the level of the real Alpha systems and usually much higher. AlphaVM-Pro is capable of replacing the DS10, DS20, ES40 DS25, ES45 class of Alpha systems. More information about the product is available here. AlphaVM is a software product which emulates your Alpha hardware on an Intel platform. AlphaVM emulation provides the functionality of an Alpha CPU but running on an Intel processor. AlphaVM can be hosted on either Windows or Linux and will run OpenVMS or Tru64 Unix. Alpha hardware emulation provides many advantages in terms of stability, performance and cost. OpenVMS or Tru64 Unix, all layered products and your applications will run unmodified on AlphaVM once emulated. AlphaVM processing is transparent to DECnet and TCPIP network protocols. The AlphaVM emulator can be accessed on your network or cluster in exactly the same way as the ‘real’ Alpha. AlphaVM utilises JIT (Just-In-Time) compilation technology to ensure extremely fast translation of Alpha code to native code. The emulator is binary-compatible with Alpha hardware and will enable you to transparently move your Alpha applications away from a dependence on legacy Alpha hardware. 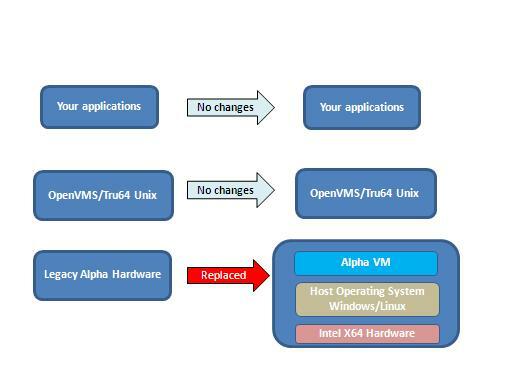 Using AlphaVM to emulate your Alpha environment will extend the lifetime of your OpenVMS or Tru64 Unix applications by removing the underlying legacy hardware platform.